If you need a basic towel for institutional use, this is it. 10S yarn, packed in bales. We only purchase towels that are made with 100% cotton in this category. 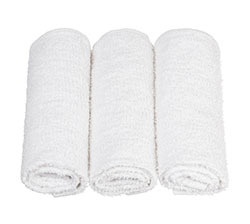 Towels are mostly used for healthcare facilities, government institutions and the prison system. These towels are heavily discounted as compared to first quality suppliers and provide great value to you and your customer.